Morteruelo is a rich and ancient dish from Cuenca, a province of Castilla– La Mancha, east of Madrid. It is a pâtélike spread of game meats, usually served during winter on toasted bread. Since Castilla– La Mancha is large, variations of this recipe exist in different areas. 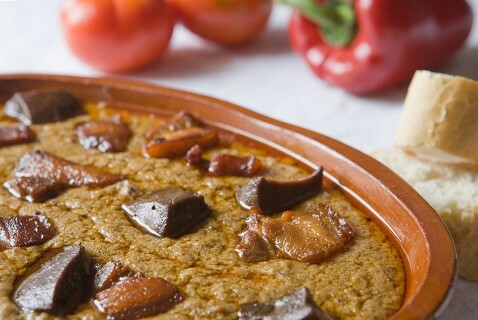 In neighboring Albacete Province, for example, there is a similar dish known as ajo mataero, and in La Solana, in Ciudad Real Province, the local version is called ajo pringue. What these dishes have in common is the slow cooking of the meats and the addition of torta, the local flatbread, to make a robust nourishment for shepherds. Today, the recipe has been revived and is widely served in restaurants specializing in traditional cooking. I usually make morteruelo when I expect a large number guests on a given day. But if you don’t finish it at a single sitting, you can refrigerate the leftovers for several days. In a large stockpot, combine the hare, partridge, pork loin, jamón serrano, and ham bone, if using. Season with salt and pepper, add cold water to cover, and bring to a boil over high heat, skimming off any foam that forms on the surface. Decrease the heat to medium-low and cook, skimming as needed, for 1 ½ to 2 hours, or until the meats are tender. Add water as necessary to keep the meats covered while cooking. Scoop the meats out of the pot and set aside to cool to room temperature. Strain the cooking liquid through a fine-mesh sieve placed over a saucepan and reserve. When the meats are cool, remove and discard any bones. Shred the meats into fine pieces and set aside. Bring the reserved cooking liquid to a boil and add the pork liver. Season with salt, decrease the heat to medium, and boil gently for 15 minutes, or until the liver turns pale. Lift the liver from the pot and let cool to room temperature. Strain the cooking liquid again and reserve about 4 cups. Grate the cooled liver on the large holes of a handheld grater and reserve. In a large sauté pan, heat the olive oil over medium heat. Add the garlic and sauté, stirring often with a wood spoon, for about 5 minutes, or until golden. Remove and discard the garlic. In the same oil, fry the bacon over medium heat, stirring often, for 5 minutes, or until lightly browned. Add the cinnamon, pimentón, cloves, and caraway seeds and stir well. Add the shredded meats and grated liver and sauté, stirring occasionally, for 5 minutes, or until well blended. Add the 4 cups reserved cooking liquid, mix well, and cook over medium heat for 15 minutes, stirring frequently. Slowly add the toasted bread a slice at a time, breaking it up with the wooden spoon until completely incorporated into the rest of the ingredients. Cook and stir for 10 minutes longer, or until the mixture acquires a smooth, creamy, pâtélike texture. Picos breadsticks are a classic part of the tapas culture of Spain, a crunchy complement to the tasty small plates that are at the center of Spanish tapas. Camperos style picos are shaped like tiny loaves of bread, and have a firm bite and perfect saltiness. Serve them with cured Serrano ham, aged Spanish cheese or a bowl of tapenade along with a refreshing glass of beer or wine..
Abadía de Acón Crianza 2009: The wine is dark purple, almost black, in color. The nose suggests ripe cherry, spice and cream. On the palate, one is immediately taken with its deep, rich red and black fruit flavors, complemented by hints of licorice, coffee and tobacco. The oak is perfectly integrated adding complexity and structure. While this is drinking beautifully now, it has years and years of life ahead of it.are shaped like tiny loaves of bread, and have a firm bite and perfect saltiness. 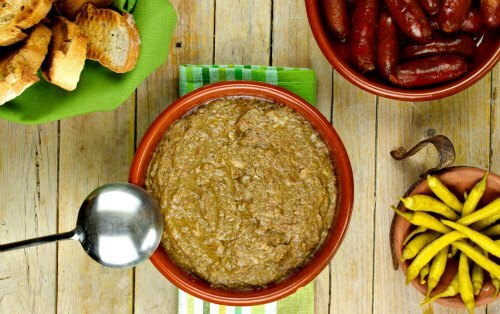 Serve them with cured Serrano ham, aged Spanish cheese or a bowl of tapenade along with a refreshing glass of beer or wine..
Ajo Mataero (Country Pâté of Pork Liver): This delicious Pâté from Albacete, a medieval town famous for its knives, is a typical first course for family lunches. It is served on a plate placed in the middle of the table, and everyone takes a portion and spreads it on toasted bread slices. 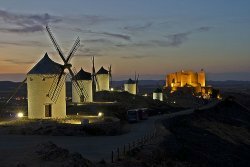 Castilla-La Mancha recipes: Located almost in the centre of mainland Spain, Castilla la Mancha and its cuisine is a very appreciated discovery for the traveller. The cuisine of this region is comprised of a great variety of traditional, hearty yet simple dishes which are prepared using elementary ingredients such as bread, meat, vegetables and accompanied by a wide range of wine, sheep's cheese and desserts, transporting the diner back to the era of Don Quixote and his faithful Sancho.